Samgyeopsal, strips of pork belly, is popular YouTuber Josh's favorite Korean food. Although bibimbap and bulgogi have dominated the image of Korean food outside Korea, there are many other interesting foods foreigners could fall in love with, the host of the channel, Korean Englishman, said during an interview with The Korea Times at the InterContinental Seoul COEX in southern Seoul, Thursday. The YouTube channel run by Josh (Joshua Daryl Carrott) and Ollie (Oliver John Kendal) has garnered over 3 million subscribers worldwide by introducing various Korean foods ― gimbap, jokbal, Korean-style fried chicken and samgyeopsal ― that are not well known to the world, but loved by Koreans. "When introducing Korean foods, many would name bibimbap and bulgogi but it was not my favorite," Josh said. "I liked samgyeopsal and fried chicken the most." He said Korean-style fried chicken has become popular in the U.K., although few know it is from Korea. As Josh and Ollie find Korean food the easiest way to introduce Korean culture to foreigners, they are planning to present various ideas through their YouTube videos. 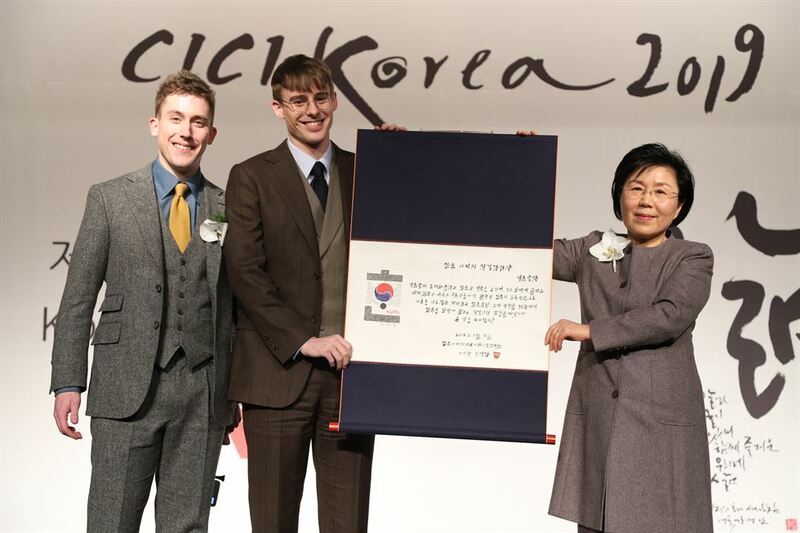 The two received the Korean Image Stepping Stone Bridge Award at the non-profit Corea Image Communication Institute's (CICI) annual Korea Image Awards ceremony that followed the interview, for bringing Korean culture to foreigners. Q: Please tell us why Korean foods appeal to the subscribers. Ollie: Food is just one of the easiest ways to introduce a culture to someone. Because you come to Korea and if you don't speak the language, there are barriers to interacting, whereas if you eat the same food, even if you can't speak the same language, you're speaking the language of food. If you put a plate of great food in their hands, immediately they understand a very little bit, but an important part of that culture. Josh: The way I experienced Korean culture for the first time wasn't through K-pop, it wasn't through Korean dramas. It was through Korean food at my Korean friend's house, when I was 13 years old. It was experiencing Korean food and Korean culture with Koreans. So that's just naturally how we wanted to share Korean culture. Q: Why did you name the channel "Korean Englishman"? Josh: In fact the reason we had chosen 영국남자 (Englishman in Korean) at the beginning, I mean, we did not know who would watch our videos. But it was mainly me, first speaking in Korean, in front of the camera and I thought, I've always shared everything I love with my friends, it's just something like I always want my friends to know and feel the things I love. And I am an English guy, speaking Korean, so in Korean, 영국남자 sums up our channel simply and I hope it will be memorable and it could turn out to be something that people would want to search and come back for. Q: How did you become interested in Korean culture? Why was it Korea, not another country? Josh: My family moved to China when I was 12 and it was a completely new experience. It was completely different from many things I'd seen and heard of before and all of my class was Korean, all of them. So I was the only non-Korean. I didn't have any friends until some of those Koreans in my class decided to try and speak English for me so that I could understand the conversation. They decided to try and invite me along to a PC bang (computer center) and play games with them. They tried to involve me in their friendship. And thanks to them, I grew up in a Korean environment in China ― to the point where, six years down the line after the most developmental years of my life, I looked at who I was, in relation to my friends, in relation to my friends' families who almost treated me as their son, and I thought of myself as much Korean as English. I don't view myself as a foreigner who experiences Korean culture. To me, Korea is a part of who I am. And this is the same way in England, as the part of who I am. And these cultures know so little about each other that I just can't help but introduce them to each other.